We spent over 19 hours researching and testing 12 different types of cat cages and found that construction materials, sturdiness, and size were most important. Midwest Homes cat playpen scored high above the others we researched and is our top pick. We liked that this cat cage was easy to set up and take down and store. It has castors on the bottom for easy moving from room to room. Cleaning is easy as well thanks to the slide out floor pan. The front doors are conveniently located and have locks so the cats can’t get out when you don’t want them to. 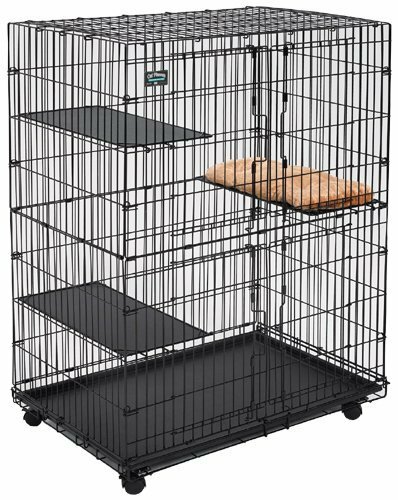 These top rated cat cages are designed to provide a safe, contained place for your cats to hang out. Whether you live in a busy city, or a small apartment without much space, you will find any one of these top rated cat cages perfect for your cat. The cat cages are not meant to be constant, permanent homes for your cat. They are good for when you are away from home, if you live in a second story or higher apartment and have a balcony, or if you want to give your cats a chance to experience the fresh air and outdoors, without being able to roam, run away, or be exposed to unsafe animals and circumstances. With the right type of cage and taking the time to teach your cat to enjoy it, your cat will truly enjoy the safety, privacy and security of their cat cage and you will enjoy knowing that they are safe indoors or out. If you’re looking for a place for your cat or kitten to play in and stay safe and healthy, the Midwest Homes for Pets Cat Playpen may be just what you’ve been looking for. Folds down for easy storage which makes it perfect for traveling as well. Equipped with casters on the bottom that roil and lock make cleaning and moving a breeze. The floor pan slides out conveniently and is made from composite plastic so it can be rinsed off easily. The front doors swing open and have dual point door latches that keep your cats or kittens safely inside. This cat cage has plenty of room for large cats and kittens and provides plenty of space for play and rest. The three wire frame shelves are sturdy enough to handle cats and kittens jumping from one to the other. The deluxe Chenille bed is attached to one of the shelves for sturdy and comfortable sleep whenever your pets have had enough play. Whether you need a cat cage for the occasional confinement of your cats or you want a regular place for them to hang out and play safely, this Midwest Homes for Pets Cat Playpen is just what you need. This large cat cage provides plenty of room for your cats and kittens to play and rest in. The spacing between the wires of this cage is set at a spacing that is safe for the occupants of the cat cage. It has two doors for easy exit and entry for your pets. The color coordinated plastic pan is made from durable ABS plastic and is very easy to clean. The four casters on the bottom of the cage make it easy to move and can be locked as well. The cage part is removable from the box. Easy to assemble with no tools required. Perches are included for your cats or kittens to sit and survey their surroundings from or to rest. The casters attach to the entire cage with screws. The slide out pan secures to the cage with hook latches to prevent it from sliding around. The entire cage measures 48” in height. The spring loaded latches keep your cats and kittens inside the cage safely so there is no worry of them getting out when you don’t want them to. The large arched doors make it easy for the cats to get in and out of the cage and allow easy access for the cat owners to handle their pets as well. When you are looking for a quality built and roomy cage for your cats and kittens, the ProSelect Foldable cat cage fits the bill perfectly. If space is limited, the IRIS Wire cat cage is just the thing to provide plenty of safe playing and resting space for your cat or kittens. It is also a great choice for grooming facilities, shelters and boarding facilities. 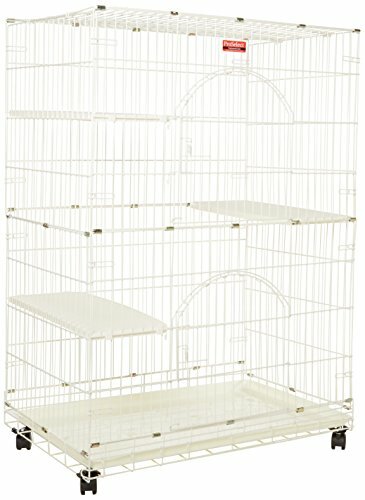 The heavy gauge wire that this cat cage is made of makes it long lasting and durable. This material is also very easy to clean and can easily be rinsed out and dried for thorough cleaning. The IRIS wire cat cage has a choice of two tiers or three tiers that include perches for your cats to enjoy and use. There are three access doors for your convenience. Equipped with 6 casters, moving this cat cage is safe and super simple. You won’t need any tools to put it together thanks to the IRIS clip system that is utilized to put it together. On the three tier model, there are three levels with plastic platforms, giving your cats or kittens plenty of playing and resting room. The doors lock securely with a convenient drop in pin lock system so your pets are kept safely inside. The bottom door is super wide which makes removing the cat box easy and efficient. The IRIS cage is attractive and fits well in any home or apartment. They are also frequently used in shelters, boarding kennels and grooming facilities as well. If you have cats, it may not even dawn on you that you may have a need for a cat cage. These top rated cat cages are perfect for those who live in apartments or who want to prevent their cats from having free reign of the home. They are especially good for those who want to give their cats some outdoor time without exposing them to all of the potentially dangerous aspects of wandering loose. Any one of these three cat cages provides space, places to jump and climb and places to rest. They are easy to store, easy to assemble and most importantly, they protect your cats and kittens from harm. Continue reading below to learn even more about choosing the right cat cage for your cat with our detailed buyer’s guide. There are several things you want to look for when choosing the best cat cage for your cats. These features will ensure that you have a good, safe, functional cage that fits your needs and preferences. Locking Doors – Having locks on the cat cage door ensure that the cat doesn’t get out unless you want them too. Since there are many reasons for using cat cages with your cats, (we’ll go over those reasons below) you don’t want to get a flimsy cage that the cat can just break out of. 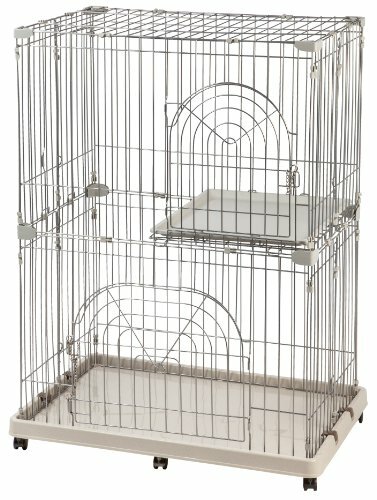 Easy to Clean – You want a cat cage that makes it easy to clean, whether it’s a large cage you walk into or it’s a smaller one with doors that open on the top and front. Most cat cages can be easily rinsed off and then dried which makes cleaning a breeze. Even though the cat should be using the litter pan, be sure to clean it out thoroughly once a week or every two weeks. Easy to Assemble – You want to get a cat cage that is easy to set up. Becoming frustrated with complicated instructions isn’t fun for anyone. Many of the available cat cage styles on the market today involve super simple set up that could be as easy as unfolding the wire and setting it into the bottom pan. Plenty of Different Levels and Perches – Cats love to climb so finding a cat cage that offers perches (shelves) to sit on and places to climb will ensure that your cats like their cages. Depending on the size of the cat cage you choose, it can have a number of levels and fun for your cat to entertain themselves with. Litter Training – Many people who have cats don’t think about utilizing cat cages at all but they can be very convenient for many reasons. One big reason is that it can make litter training a new litter of kittens much simpler because the cats are contained rather than being allowed to run through the whole house. When kittens are first learning to use the litter pans, having free reign of the house can be just too much space to handle. When using a cat cage to help litter train kittens, make sure that the cage is one level so the kittens are not in danger of falling off the higher shelves. You want the cage to be large enough to house the litter box, their food and water dishes and a box for them to sleep and rest in as well. Any bigger and they will have the opportunity to have “accidents”. Any smaller and they will be uncomfortably cramped. The good news is that using cat cages to teach litter box habits is not simply for new kittens. You can use it for older cats that have gotten off track as well. It will take patience and consistency, but they can relearn how to use it, or if they are used to being outdoors, they can learn initially what a litter box is for. Calming down and Taming Feral Cats – Cat cages can be very useful for taming down feral neighborhood cats and giving them a chance at finding real homes. If a feral cat you are working with is pregnant, be sure to make it a one level cage so she doesn’t try to have the kittens on the upper levels. It is also beneficial to take the feral mother cat out of the cat as soon as the kittens are weaned. This makes the young ones much easier to train, especially using the cage, because they are not influenced by the mother cat’s fear of people. The cage ensures that the feral cats come into contact with the humans taking care of them which can make the whole process easier and faster as well. Don’t push them too hard since they will be confined and take your time to build trust with them. It takes time but it can be done and these feral cats can become beloved house pets with that patience. Separating Ill Cats from Healthy Ones – At one time or another; it may become necessary to separate a cat from the others if it contracts a contagious illness or condition. If you’re bringing in a new cat to live with your existing cats, you can use the cat cage to keep them separate for a minimum of two weeks before allowing the, around the others. You want to be sure that the new cat doesn’t have anything that is detrimental to the rest of your cat family. When using the cat cage as a quarantine cage, it is important that it is in an area that the rest of the cats in the home (or business if you are using this in a veterinarian’s office) can’t have any access to it. There will be plenty of time to introduce them to each other once you have ensured the health and safety of your existing cat family. Quarantine cages can be any size, so take advantage of this and get something that will give them privacy, a place to perch and rest and places to play, eat and drink. Using the cage for new and even existing cats that may become ill, is a great way to prevent one sick cat from infecting the rest accidentally. Introducing a New Cat Member of the Family – When introducing a new cat to the family, not only is it safer health wise to use a cat cage, it can make the addition of a new feline member of the family much less stressful for the existing cat. Place the new cat in the cage and make sure that the existing resident cat can meet the other cat face to face at all points of the cage including the upper levels. This enables both cats to get used to each others’ scent, get used to seeing each other and can make the transition from “Only cat child” to one with “siblings”. It also prevents unnecessary fights between the two if they are too quick to infringe on each others’ territory. If the existing house cat shows any stress or anger during this time, use that as a sign to slow down a bit. There is no rush and no danger to the caged cat by taking your time and the outcomes will be much more favorable as well. Moving to a New Location – One of the most unsettling times for a cat can be moving from one location to another. It is important to introduce your cat to a new home slowly and in a controlled manner, especially if you have a cat that is shy or skittish to begin with. Using a cat cage for this transition is the perfect way to help them get acclimated to the new surroundings with little to no trauma, especially if they have been in the cage before. Equip the cage with their same food and water dishes, litter pan, toys and any bedding they use. Have the cage in a social part of the home, but not one that involves chaotic traffic. Leave the cage door closed while they are getting used to the new sights, smells and sounds. Once they seem much calmer, open the cage door and allow them to venture out on their own. Leave the cage for them to go back to for a safe spot. You will know when they don’t need it anymore although some cats will prefer using it for bedtimes. It doesn’t harm the cat to allow them access to the cat on a permanent basis. To Allow Protected “Outdoor” Time – Most cats are either exclusively outdoor cats, indoor/outdoor cats, or strictly indoor cats. Studies have shown that indoor/outdoor and outdoor cats have much shorter lives than those cats that live exclusively inside. This isn’t too surprising considering the fact that the outdoors can be a real hazard to your cat. Between dogs that run loose, toxins that are all too commonly found outdoors, to being hit by a car, having your cat outdoors can be very dangerous for them. Having a cat cage for your cat gives them the opportunity to be outside without being exposed to the dangers being outside presents. Cat cages used outdoors will give the cats the chance to smell the smells hear the sounds and feel the breezes and sun and they will be protected from any harm. If you are exclusively going to have them in an outdoor run, make sure it is one that allows room for their perching needs, running around, jumping climbing and scratching needs as well. There are large cat cages that can provide all this and your cats will love them. For outdoor cages, there needs to be a top or roof and a solid bottom of some kind so the cat can’t dig their way out. Whether you are a private cat owner with several cats, a shelter that needs room for several cats or an animal boarder that is looking for great ways to provide space and room for many cats. With the increasing dangers involved in a cat being outdoors, even part time, a cat cage is a great alternative to providing some outdoor time without exposing them to all the potential dangers that are very common. With the information in this buyer’s guide, not only do you know what to look for in a cat cage, you know many ways it can be used to enhance and extend your cat’s life.